Do you listen to any podcasts about writing? I stumbled across the Self-Publishing Formula podcast* recently and I find it very useful. I say “stumbled across” but if you listen to the podcast, you soon realise that its presenters put a huge effort into ensuring people do find it. My stumble across was nowhere near accidental. Two authors present the Self-Publishing Formula, one a huge self-publishing success and the other starting out. Mark Dawson is the best-selling author of the John Milton, Beatrix Rose and Soho Noir series. He’s a six-figure sum, self-publishing success story. A lot of that success is down to targeted, skilful marketing. 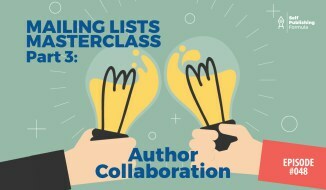 Dawson is known for using Facebook ads to good effect and runs courses for authors on how to do so too. Interestingly enough, the author was originally traditionally published. His first book, The Art of Falling Apart, was published by Pan Books in 2000. The book didn’t sell well at all. He later self-published a thriller, which again didn’t do well. However, he then decided to give the book away for free. At that point, his sales took off. These days, he’s a hybrid – self-published in this country, traditionally published in other places. The podcast is co-presented with James Blatch, a writer setting out on the self-publishing journey. A good story should be plotted like a film. Psychological thrillers are selling well at the moment. You need to have a few books to your name to be successful. A cover is really important, but not that important. Mark Dawson’s readers often chose his books based on the blurb. It’s not easy to write your own blurb. Permanently offering one of those books for free is a good tactic. A mailing list is a must. As any modern marketer will tell you, email newsletters provide the best return on investment. A healthy Twitter following will help you get more subscribers to that list. Offer them a freebie – a free book or a free ‘how to’ guide to get them to sign up. How do you get more Twitter followers? Go for the “if I follow them, they’ll follow me back” rule. Target people in the same industry, use automated tools to help you find followers. The author Ian Sutherland has a book for authors – Advanced Twitter Techniques for Authors. A reader survey is another good idea. This helps you target marketing appropriately and work out what’s the most worthwhile material to write in the future. Hey – there are some fab ones out there. I also listen to ‘Being Boss’ – great mindsets for creative people and CTRL ALT DELETE – she interviewed Sophie Kinsella on being an author – fab!